High-performance gaming PCs do not have to be big, and the rising popularity of SFX systems among gamers proves that many people already know it. Along these lines, EVGA on Thursday became yet another high-end brand to enter the market of SFX power supplies. The EVGA SuperNova GM SFX PSUs are rated for up to 650 W output, feature modular design, use reliable capacitors, and come with a base seven-years warranty. 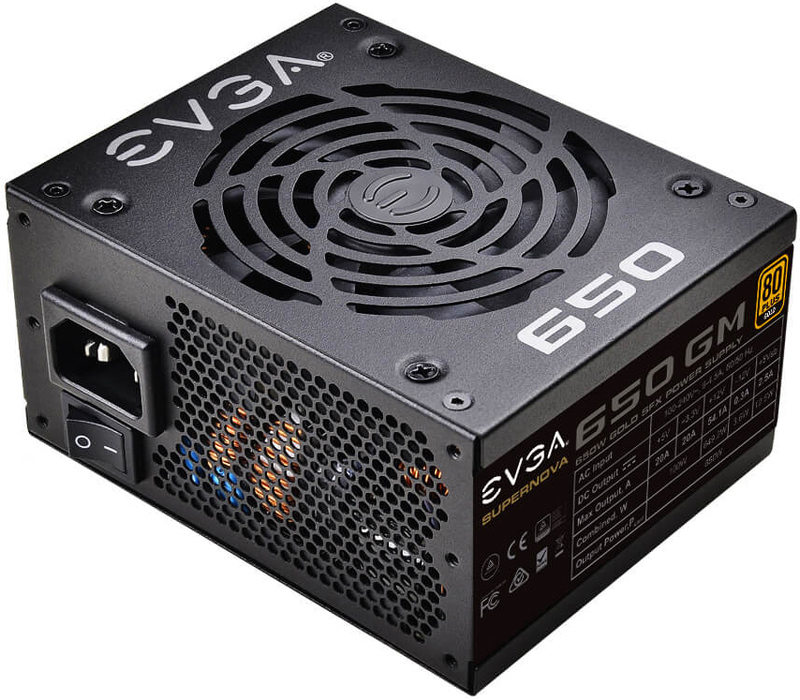 The EVGA SuperNOVA GM SFX lineup of power supplies includes three SKUs rated for 450 W, 550 W, and 650 W maximum load. All three models are compliant with the SFX12V V3.3 and ATX12V V2.4 specifications and carry the 80 Plus Gold certification badge. The power supplies come in standard 100-mm depth chassis and are outfitted with a 92-mm double ball bearing fan that kicks in only when the load exceeds 30%. All three also feature a modular design to ensure clean system builds and easy cable management. Like other high-end PSUs these days, EVGA’s SuperNOVA GM SFX power supplies use Japanese capacitors rated for 330 uF/420 V and high temperatures (which EVGA does not specify). The SFX power supplies from EVGA come equipped with EPS12V power connectors (one 24-pin and a 4+4-pin connector). 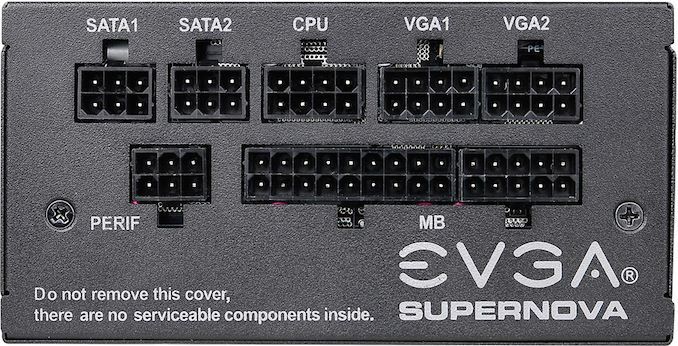 Depending on the model, the PSUs feature two or four PCIe 8-pin PCIe auxiliary power plugs for up to two high-performance graphics cards (or one of EVGA’s K|NGP|N boards that need three inputs), four or six SATA power connectors, four Molex power outputs, and one FDD connector. All the cables are individually sleeved for greater flexibility. Given the maximum output of 650 W and a vast amount of connectors, some of these SFX power supplies may end up in Micro-ATX or even ATX systems, which is why EVGA supplies an ATX bracket with the PSUs. Moving on to reliability and operating temperatures. The EVGA SuperNOVA GM SFX PSUs are rated to work at up to 40℃ with a 100,000 hours MTBF. To guarantee safety and reliability, the PSUs are outfitted with over current, over power, over/under voltage, over temperature, and short circuit protection technologies. 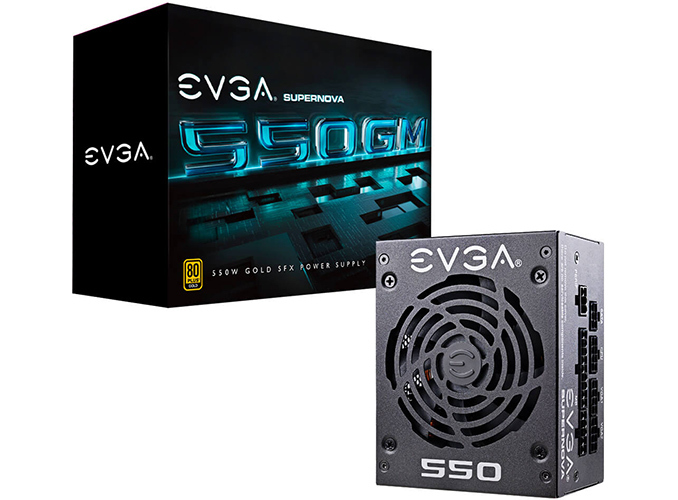 EVGA’s SuperNOVA GM SFX power supplies are now available directly from the company. The basic 450 W model costs $110, the 550 W SKU is priced at $120, and the 650 W PSU carries a $130 price tag. EVGA is a yet another high-profile supplier of PSUs that decided to enter the market of SFX products in the last couple of years. As of 2015, only two "gaming" brands offered such power supplies — Corsair and SilverStone. In the period between 2016 and 2017 four new players started to ship SFX PSUs, including Be Quiet!, Enermax, FSP, and Thermaltake.